The unique properties of nanoclay such as chemical resistance, thermal stability, mechanical strength, and improved clarity have made it a preferred material in industries such as automotive, pharmaceuticals, and coatings amongst others, reports Transparency Market Research. The global nanoclay market is expected to have an opportunity worth US$3,369.3 mn by 2023 as compared to US$1,222.0 mn in 2014 due to commercialization of nanoclay-reinforced polymers and their growing demand in nanocomposites, which is likely to reduce the price of the final products in the overall market. The market is expected to expand at a CAGR of 12.0% between 2015 and 2023. The booming manufacturing activities in Europe and Asia Pacific are likely to offer lucrative growth opportunities to the global nanoclay market. The low cost of labor and affordable production costs are encouraging manufacturers to set up bases in Asia Pacific, thus boosting the demand for nanoclay in this region. Rapid urbanization, which has skyrocketed the construction activities in Asia Pacific has also triggered a demand for nanoclay in the past few years. End users are generously using nanoclay as they are known to improve the quality of polymers, which is an important raw material in manufacturing activities. The types of nanoclays available in the market are kaolinite, smectite, and others such as illite and vermiculite. Out of these, the smectite product segment is expected to grow at the fastest CAGR of 12.4% between 2015 and 2023. These are primarily used as clay barriers in chemical and nuclear wastes for their abilities such as long-term structural ability, low permeability, and cation-exchange capabilities. Montmorillonite is the most widely used nanoclay in polymer nanocomposites. Amongst the end user industries, the food packaging industry uses nanoclays to a great degree due to their incredible strength, barrier properties, durability, and moisture stability. Nanoclays that contain montmorillonite are gaining immense popularity in the plastic packaging area due to their peculiar properties. Citing these reasons, the packing segment of the overall market will expand at a CAGR of 12.7% during the forecast period. 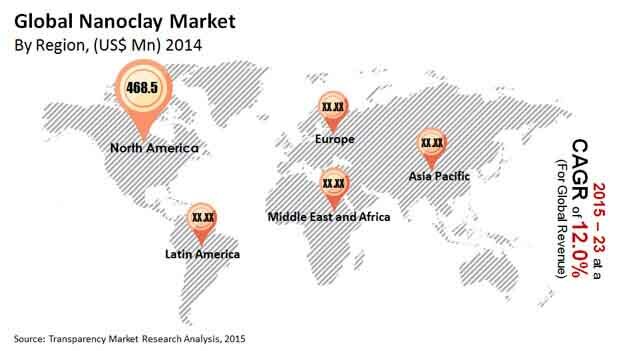 North America was the leading regional segment in the global nanoclay market. During the forecast period, it is expected to expand at a CAGR of 12.9%. The demand of nanoclays in North America is dominated by the automotive segment, while the packaging industry also makes a significant mark by being the leading consumer. Analysts predict that the growth of the nanoclay market in Asia Pacific is also expected to be the fastest in the coming years due to burgeoning automotive and packaging industries in China. This region will also progress due to rampant urbanization and demand for nanoclays in the easing the pressure of migration to urban areas through construction and related activities. The leading players in the global nanoclay market are Kunimine Industries Co. Ltd, UBE Industries, Mineral Technologies Inc., Elementis Specialties Inc, RTP Co., and Techmer PM. Extensive research and development activities and focus on product innovation are expected to be key strategies for companies to acquire larger market shares in the coming years. Nanoclays are layered mineral silicates that are divided into various classes depending on their chemical composition and morphology. Commonly used commercial nanoclays include montmorillonite, bentonite, kaolinite, hectorite, and halloysite. Nanoclays are employed in the reinforcement of liquid silicone rubbers, fibers, polymer films, hybrid phenolic friction composites, and non-woven and other composite materials in polymer nanocomposites. This report forecasts and analyzes the nanoclay market on regional and global levels. The study provides historic data for 2014 coupled with forecast from 2015 to 2023 based on volume (kilo tons) and revenue (US$ Mn). It includes drivers and restraints for the nanoclay market along with their impact on demand during the forecast period. Additionally, the study comprises opportunities available in the nanoclay market. Detailed value chain analysis has been included to provide a comprehensive view of the nanoclay market. Analysis of Porter’s Five Forces model for the nanoclay market has also been included to help understand the competitive landscape in the market. The study analyzes the nanoclay market by segmenting it based on products, end-users, and regions. Regional segmentation includes the current and forecast demand for North America, Europe, Asia Pacific, Latin America, and Middle East & Africa. The segmentation comprises demand for nanoclay in products and end-users across all regions. Product segmentation includes kaolinite, smectite, and others, while end-user segmentation comprises flame retardants, automotive, paints & coatings, and others. Prices of nanoclay vary in each region. Hence, a similar volume-to-revenue ratio does not follow for each individual region. Regional average price has been considered while breaking down the market into product segments and end-users in each region. Market numbers have been estimated based on demand for various grades of nanoclay, viz. kaolinite and smectite, and end-user segments such as packaging, flame retardants, automotive, paints & coatings, and others. Market size and forecast for each product segment and end-user have been provided in the context of the global and regional market. The nanoclay market has been analyzed based on expected demand. Prices considered for calculation of revenue are average regional prices obtained through primary quotes from numerous regional suppliers, distributors, and direct selling regional producers based on manufacturer feedback and application requirement. The report also offers competitive landscape of the overall market with company profiles of players such as Elementis Specialties Inc, Kunimine Industries Co. Ltd, UBE Industries, Mineral Technologies Inc., RTP Co., and Techmer PM. Detailed description of the company overview in terms of headquarters, inception, upcoming capacities, key mergers & acquisitions, financial overview, and recent developments provides a thorough idea about the competitive positioning of the players in the market. Where no hard data was available, we used models and estimates to produce comprehensive data sets. A rigorous methodology was adopted, wherein the available hard data was cross-referenced with data types such as demographic data and macroeconomic indicators to produce estimates. The top-down approach was adopted to estimate and forecast market volume by geography.